The 2019 $0 down, VA home loan limit for Payette County is $484,350. Thanks to the Snake and Payette Rivers, Payette County has some of the best opportunities for aquatic activities in Idaho. The Idaho County Legislature officially created Payette County in 1917. The county was named after the Payette River, which flows through the county. The county is also home to the Deer Flat National Wildlife Refuge, giving Payette scenic views and great outdoor activity options. With a total surface area of 410 square miles, Payette County is the smallest county in Idaho. The total population of the county is 22,836, including a veteran population of 2,002. For some of the most beautiful views and many outdoor activity options, visit Deer Flat National Wildlife Refuge. The refuge is known for its abundance of bird species, including mallards, Canadian geese, and more. In fact, Deer Flat was named a “Globally Important Bird Area” by the American Bird Conservancy. The entirety of Deer Flat National Wildlife Refuge is made up of wetlands, riparian forests, uplands, and croplands. There is a visitor’s center located in Deer Flat that provides information on the habitat and the types of wildlife species that reside in the refuge. For some of the best fishing or boating opportunities be sure to visit either the Snake River or the Payette River. These rivers are home to a diversity of fish species, making them some of the best fishing spots in Idaho. Visitors to the Snake and Payette Rivers enjoy taking out their canoes and rafts for a relaxing float down the river. For picnics or other family gatherings, be sure to enjoy one of the many picnic areas along the rivers. If you enjoy camping, there are many spots perfect for it along the Snake and Payette Rivers. For those with children, Payette County has a thriving school system. With three large school districts, Payette County is sure to have all the resources both children and parents will need to ensure a good education. Each district includes a middle school, elementary school, and high school. Payette Joint District 371 even includes a night school for adults interested in continuing their education. The Veteran Advocates of Ore-Ida Office, Disabled American Veterans Office, Malheur County Veterans Services Office, and several other veteran resources are located in proximity to Payette County. Some of the benefits offered to veterans living in Idaho include disability compensation, tax breaks, and many more. The median housing cost is $132,700, and the median household income is $43,649. 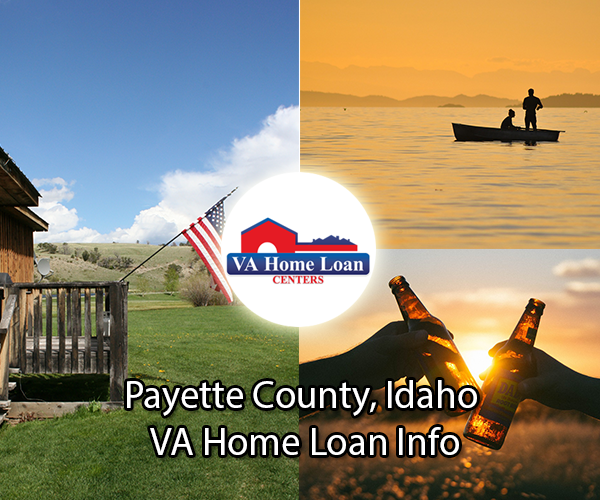 Contact VA Home Loan Centers for help finding a VA-approved property in Payette County and to complete a VA loan application. 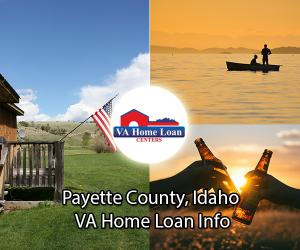 For an updated list of VA-approved properties in Payette County, call VA Home Loan Centers at 888-573-4496. There are not currently any VA-approved condos located in Payette County. Let VA Home Loan Centers help you obtain condo approval on almost any condo!